Send2Fax provides the standard faxing features such as to send and receive faxes through a web interface or an email. This service supports a security level that is also HIPPA compliant and also offers several service plans. Send2Fax is one of the most easy-to-use online fax services that effortlessly blends its features into a great interface that creates an experience similar to using an email account. Its best feature is its functionality that allows one to send and receive faxes through a preferred email client. One can take advantage of this service wherever there is internet access. Meanwhile, this service doesn’t offer a competitive storage option, its basic plan allows you to send and receive only 350 faxes a month in total. On crossing the monthly limit, you are charged with 12 cents per fax you send and receive. There isn’t any limit to the amount of faxes that you can store but the time period of storage under this basic plan is limited to only 30 days. Fax storage after 30 days will cost you 1 cent per fax per month. But you can always store faxes in your email account and retrieve and print as per your convenience. You have toll-free and local fax numbers, and it also allows you to send multiple documents in one fax only. You can also receive emails in multiple email clients and this service also provides international faxing. It also offers an email plugin for both Outlook and Outlook Express, and you can send a fax to multiple recipients simultaneously. This service supports a variety of formats including Microsoft, Adobe, and WordPerfect as well as plain text, HTML, MODI, and MDI. Send2Fax can also transfer four types of images: TIFF, PNG, GIF, and JPG. It doesn’t offer any digital signature feature or any mobile fax alerts. This service has a FAQs section its knowledge base filled with answers to billing-related and technical questions. It also offers stepwise instructions on how to send faxes online. In case you can’t find the answer you are looking for, you can also send an email or fill out the contact form provided on the website. You can also contact their toll-free telephone support during business hours. Well, a couple of things like user guide and live chat is unavailable. As your 30-day trial subscription runs out, you can also subscribe for $8.95 a month under the basic plan and in case you have more requirement, you can go for $12.95 a month with Small Business Plan. This plan offers a total of 350 inbound and outbound faxes, much higher than the total of 150 offered in the basic plan. There is no activation fees for this service. All you need is a credit card that you require to sign up for the free trial, but you can always cancel the trial at any time as per your requirement. 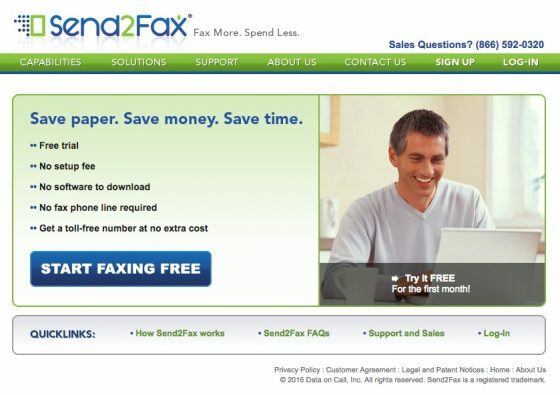 With this, we end our review of Send2Fax online faxing service. You can go ahead and use this service and in case you need to share your experience with us, you can always mention your views in the comment section below.